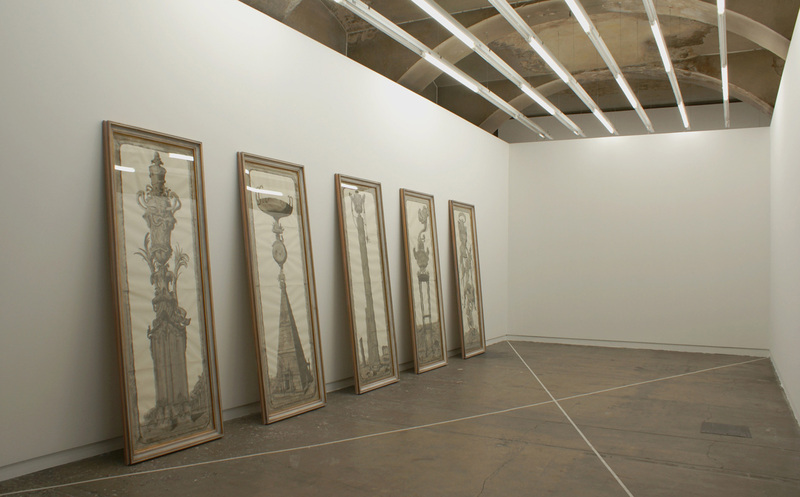 Galleria Franco Noero is pleased to present Pablo Bronstein’s solo exhibition. In the gallery space of Via Giolitti, the artist presents a unique piece composed by five big works on paper entitled Five Urns, inspired by the architectural drawings of the second half of the Eighteenth century, in the transitional period between Absolutism and Revolution. Each of the five features the manner of a typical style of the period: the love for China and the “chinoiserie”; the Egyptian architecture and the “Egyptomania”; the archaeology and the taste for the antique; the idyllic countryside landscapes and the “campestre”; the motifs inspired by the Empire period in France and, by opposition, by the events linked to the Revolution. The frames are deliberately excessive and of an almost “vulgar” opulence to evoke the meaning of time in the applied arts’ expression and the sensation of a timeless empty space. The intention is to convey a sculptural quality to the drawings through the frames, and to reflect on the idea of post-modern, on the contemporary art’s perception and on its conventional presentation in codified spaces, and on the aesthetic of “contemporaneity” in general. The horizontal space of the Gallery is definied by a cross realized applying simple masking tape on the floor, quoting the symbol that in architectural drawings indicates the void. It symbolically refers to a physical and temporal abstraction of the space, to the ideal vision of a ‘piazza’ and to the sense of “citizenship” that this last expresses. A concomitant event to the exhibition is a performance that will take place inside the courtyard of Palazzo Saluzzo Paesana,one of baroque masterpieces of Torino,choreographed by the artist in collaboration with the dancers of the Liceo Coreutico Teatro Nuovo of Torino. The dancers determine a spatial connection with the space around them striking poses inspired by the tradition of the neo-classical ballet, while hinting the idea of History and “shape”. The choreography is rarefied and purposedly elementary, in order to overread the minimal language of the tradition of performance.